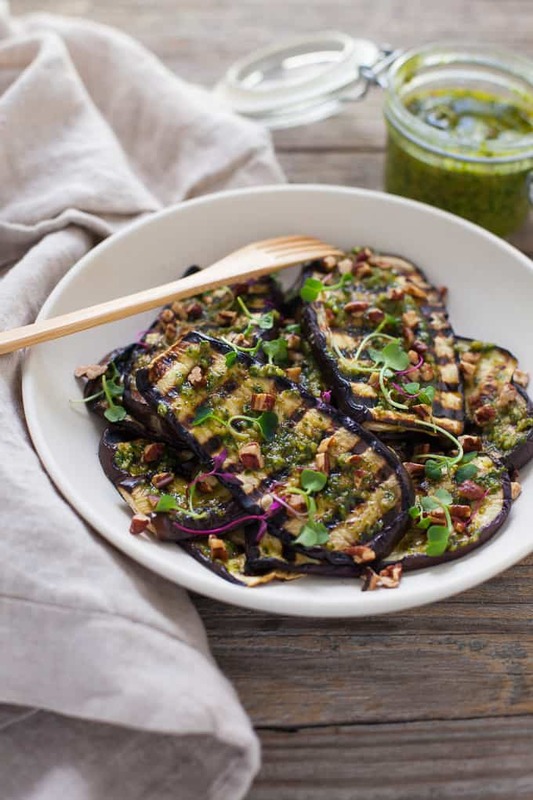 This grilled eggplant with pecan pesto is deliciously satisfying for a summertime side dish or plant-based main! This post is sponsored by The American Pecan Council. Thanks for supporting the brands and organizations that make TFD possible! As always, opinions are my own. If I had to pick one sauce to eat all summer long, it would have to be pesto. Light and refreshing, pesto goes well on just about everything: soups, salads, pastas, sandwiches, fish, meat, vegetables, pizza, you name it. And with the abundance of produce that we have at our fingertips during summer, pesto is an easy way to use up excess herbs and greens. I love to make a big batch of pesto during the summer and freeze it in an ice cube tray so that I can pop ‘em out whenever I need ‘em. Most people are familiar with basil pesto made with pine nuts, parmesan and olive oil but you can really make pesto with just about any herb/green, any nut, cheese or oil! It’s totally customizable based on what you have on hand. For today’s recipe, I used toasted pecans as the nut base for my pesto. If you’re thinking PECANS in PESTO?, you’re not alone. Most people associate pecans with the holidays and a good ol’ slice of pecan pie. But pecans are much more versatile than you may think. Their rich, buttery flavor and crisp texture makes them an ideal ingredient to add to salads, snacks, whole grains and vegetables. Not to mention their nutrition benefits – pecans are full of flavonoids, the same beneficial plant compounds found in superfruits. They’re also a good source of monounsaturated (heart-healthy) fats and satiating fiber. So it’s no surprise that research shows that eating a serving of pecans each day may help reduce your risk of heart disease. 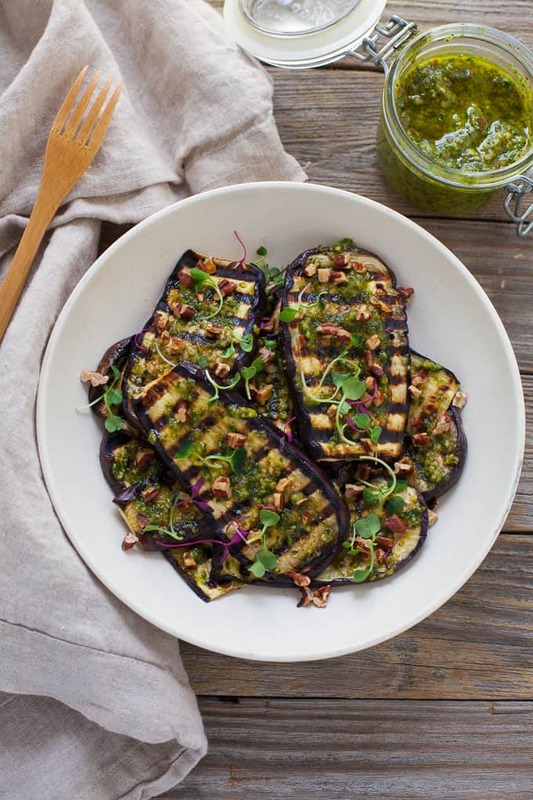 This pecan pesto is perfect on grilled eggplant – the eggplant is smoky and meaty and then the pesto provides a bright, fresh flavor to round it out. The toasted pecans on top provide a nice nutty flavor and satisfying texture. I’ve already used this pesto on top of salads, fish, and this morning I put a little over my eggs for breakfast – SO good. I can’t wait to use it on the rest of my CSA veggies this summer. This recipe can easily be made on an outdoor grill or on a grill pan so don’t fret if you’re sans backyard grill. I’ll be bringing this recipe to a potluck networking dinner this week and can’t wait to share it with some of my colleagues. Enjoy this recipe at your next summer cookout as a side dish or a plant-based main. Oh, and the leftovers are delicious on top of fresh mixed greens with a little extra pesto! 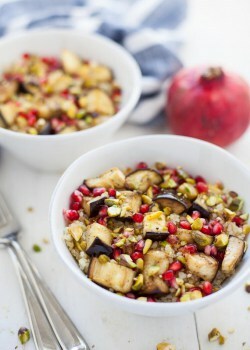 Generously salt the eggplant and place eggplant into a colander over a bowl or over the sink. Let sit and drain for one hour. Rinse with cold water and thoroughly pat dry. Brush both sides of eggplant with olive oil and season with salt and pepper. Heat a grill or grill pan to medium-high heat. 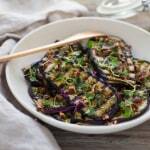 Place eggplant slices on the grill and cook for 4-5 minutes on each side, or until browned. 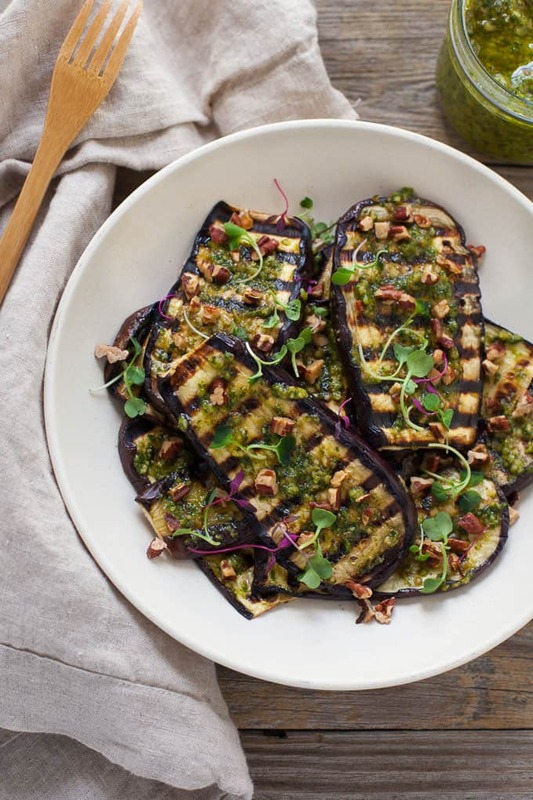 Spread pesto on top of eggplant and top with chopped pecans and optional microgreen garnish. Add the basil, pecans, cheese, garlic and lemon zest to a food processor and pulse until coarsely chopped. With the processor running, slowly add olive oil and process until fully incorporated and smooth. Season with salt and pepper. Note: To toast pecans, preheat oven to 350 degrees F. Spread pecans on a parchment-lined baking sheet and bake for 5-8 minutes, or until aromatic. Tell me, have you ever used pecans in pesto before? What are some of your fav ways to use pecans other than in pie? 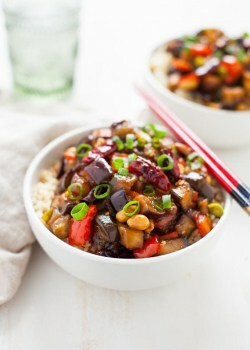 For more eggplant dishes, check out my recipes below! That looks SO good! Did the skins stay soft enough to be cut through easily? Thanks! They sure did! I don’t like when the skins are tough either. That microgreen garnish is game changer! How beautiful. I’m ready to go pick up an eggplant right now! Thanks Stacey! 🙂 hope you enjoy!! This looks ah-mazing Kara!!! I love pecans, but have never used them in pesto. 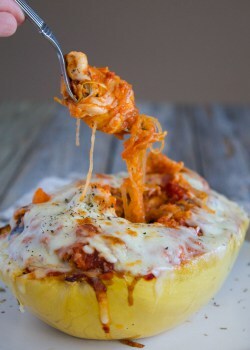 Seriously, can’t wait to make this! Anything with pesto has my name all over it! Thanks for this great summer recipe idea! You’re welcome Jodi! Happy eating! This looks absolutely amazing! I am definitely trying this while grilling season is still here! Thanks Jessica! I hope you enjoy–it’s a staple for me this season! Looks so delicious! I love eggplant! Pesto is my favorite summer sauce too! This recipe looks fantastic – can’t wait to try it! I don’t like eggplant, really because I don’t know what to do with it but I get it all the time in my farm bag. I will try this recipe next time. Thank you! Thanks Jillian! 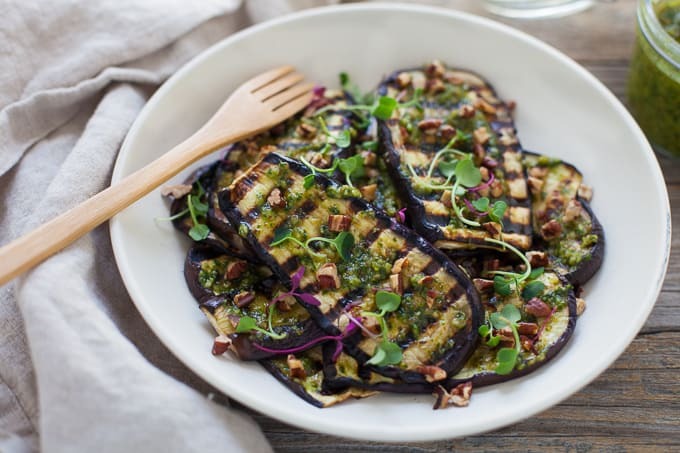 I hope you enjoy this recipe–it’s a great way to showcase the beauty of eggplant without sacrificing flavor 🙂 plus, the pesto complements the flavors nicely! Grilled eggplant is one of my favorites! Looking forward to try making this recipe over the weekend! Yum! Pesto is absolutely my go-to all summer as well. I think pecans are the one nut I haven’t tried in it yet! This is absolutely stunning! Pecans in pesto is genius! Trying this summer on the grill! Thanks so much Kathryn! I hope you enjoy–this is a recipe that is on repeat in my house during the summer!